ሐዋርያት የተሰበሰቧት ቅድስት ቤተ ክርስቲያናችን ከመጀመሪያዎቹ ሐዋርያት ጀምራ እስከ አሁንም ድረስ ከዲቁና እስከ ጵጵስና ለተመረጡ አገልጋዮቿ ሥርዓተ ሲመት ስትፈጽም ኑራለች፡፡ ቤተ ክርስቲያን በምድር ያለች የእግዚአብሔር እንደራሴ የፀጋው ግምጃ ቤት እንደመሆኗ ምእመናንን ለመጠበቅ እና ለማሠማራት እንድትችል ሥልጣነ ክህነት የምትሰጥበትን ጥብቅ ቀኖና በፍትሕ መንፈሳዊ በመደንገግ እና በሥርዓተ ቤተ ክርስቲያን ደግሞ ዝርዝር የአፈጻጸም መመሪያ በማዘጋጀት በትምህርታቸው የበሰሉትን በሃይማኖታቸው ነቅ በምግባራቸው ጠንቅ የሌለባቸውን አገልጋዮች ስትሾም ኖራለች ወደፊትም ትኖራለች! Please post the detail 30 person name and let us do something before this big mistake is accomplish. Wey Geta, degmo Min Tasemanaleh? "ሲሞናውያን" ምናምን ለምን ትላላችኹ? በተለያየ ጊዜ እንዳስነበባችኹን፤ አኹንም በጻፋችኹት ውስጥ በየመሥመሩ መካከል ያለውን ለሚያነብ ቀርቶ በየመሥመሩ አናት ላይ የጎለታችኹትን ግብዳ እውነት ልብ ለሚል፤ አባ ጳውሎስ ስንኳን መንፈሳዊ ሕግ በጭራሽ ሕግ የሚባል ዕሳቤ የማይገባቸው ዕብነ መኾናቸው ግልጽ ነው። ታዲያ የቀረቡት ዕጩዎች "ፍጹማን" ቢኾኑስ ርሳቸው ሊሾሟቸው እስከተሰለፉ ድረስ መንፈሳዊ ሲመት ይከናወናል ብላችኹ ቅንጣት ታስባላችኹ? 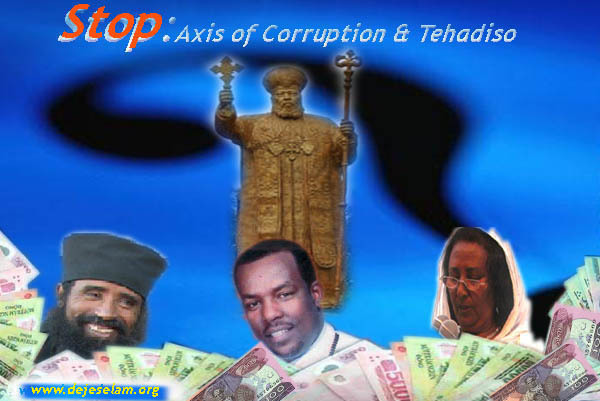 Let's start a protest around each EOTC church that can get rid of Tehadiso and their followers from the church! የሁሉም አአባ ጳውሎስ እጩዎች ሙሉ ዝርዝር ከሌላችሁ አሁን በእጃችሁ ያለውን አሳዉቁን፤ ቀጠሮውን ምን አመጣው?! ሕዝቡ ይወቃቸው። መፍትኄውን አብሮ ለመጠቆም ብላችሁ አታዘግዩት። ሕዝቡ ቤቱ ነውና ራሱ መፍትኄውን ይፈልጋል። ምን አይነት ሰው ጣለብን መዳኃኔዓለም?! minew ? minew ? minew ? beza ahin yemiwera tsefito new yihininn yemnanebew yasazinal menekakef bicha ke 30 menekosat mekakel minim menfesaw yelem yibalal ?lemenafikan ye mastemariya agenda honn yih mannem ayitsekmm churchn gin betsam yigodal astewlu amezazinu hulum yalfal tark gin ayalfim yesewn bedelna hatsiat mezerzer ayigebam papaw menekusaw peristu diyakonu sebakiw zemariw hulum menafik alemaw tebalu manew dehina ? sew tsefa malet new ? lemehonu yihen yahil birr yalew menekuse ethiopia wust ale malet new ? metechach menekakef mesedadeb mewraref metelalef beza papawn menekusewn kahinun diyakonun sebakiwn zemariun hulunm menafik zerfi durye alemaw alnew dehina sew manew ? ahun yetsekemnew mann new ? lemenafkan agenda kefetn metsekemiya honn mastemar memker memeles yikir mebabal mesewer ayishalim wey ? I would have preferred to be deaf than to hear such very disturbing news. Once in Gojam a QINAE scholar went to the then archbishop of the province,Abuna Marqos to be ordained as a deacon. During registration, the ABUNA QESIS requested him to pay a some money. KEMAHU LEWOLD ESME MENIFES QIDUS TESAITE"
is being sold like God the Son.Thank you Dejeselam. BERTU. I would have preferred to be deaf than to hear such very disturbing news. Once in Gojam a QINAE scholar went to the then archbishop of the province,Abuna Marqos to be consecrated as a deacon. During registration, the ABUNA QESIS requested him to pay a some of money. well, this the end. I think we all need to take actions in every aspect. Even though they are our fathers we don't have to keep quite or just talk. Physical, mental or any other action to remove the whole members who support this activity should be our last resolt. Our church needs to get cleaned all these messes. እግዚኦ! አቤቱ ስለ እኛ ሳይሆን ስለ ቀደሙት ደጋግ አባቶቻችን ስትል የምንሰማውን አታሳየን! ደጀ ሰላማውያን እባካችሁ በፍትሕ መንፈሳዊ እና በሥርዓተ ቤተ ክርስቲያን ያለውን የጵጵስና አሿሿም ዝርዝር ብታሳውቁን:: It would be nice if u scan it and paste it here. The time has come. Belive it will pass. But let us do some cordinated action.God will not forget us.Please, let us have some cordinating figures so that we will act. ደርሶአልና፤ አስቀድሞም በእኛ የሚጀመር ከሆነ ለእግዚአብሔር ወንጌል የማይታዘዙ መጨረሻቸው ምን ይሆን? ሰየላም ደጀሰላማውያን መቸም ለወጉሰላም አልኩዋችሁ እንጅ እንደዚህ አንጀት የሚያቆስል ጨጉዋራን የሚልጥ ዜና እያስደመጣችሁን ምንሰላም ታገኛላችሁ! እንደውለመሆኑ እግዚአብሄር ስንቱን ሩጦያልጠገበ ወጣትና ስንቱን የቤተክርስቲያን ሊቅ ያለግዜያችው(በሰውኛአመለካከት)ሲወስዳቸው ምነው ይሄንሰውየ እድሜያቸውን አረዘመው ይሄንያልኩት መቸም ቢቸግረኝ እንደሆነ ትረዱልኛላች እንጅየክርስቲያን ደንብስ አይደለም እርሳችውምቢሆን ጤናችው አሳሳቢሁኔታላይ እንዳለ ሁሌነው የሚወራው ጋንግሪን እንደያዛቸውና በየግዜው 8000ሽ ብር እየከፈሉ በመርፌ እድሜያቸውን እንደሚያራዝሙ ነው የሚወራው ተዲያ እኒህሰውየ ጉቦ ቢቀበሉ ምንይደንቀኛል በዘመዶቻቸው ከነክብርህሙት እንዳታዋርደን እግርህን ተቆርጠህ እየተባሉ ያሉስውናቸውና እኔስ ብሆን ከኒህሆድአምላኩና የቤተክርስቲያን ጠር ከሆኑሰውየ በሞትላንዴና ለመጨረሻግዜ እንድንገላገላቸው ብየነው ለዚያውም ጦሳቸው መችእንዲህበዋዛ የሚለቅ ነውና! እውነት አማኙን እንዲህ በመበጥበጥ ምን ታገኛላችሁ? አሁን ማን ይሙት፣ የትኛው መነኩሴ ነው ግማሽ ሚልዮን ብር ያለው? ye ethiopian hzb saycharsu lemen ayewordom ?yalechwot edme tnshe nat menyarglwtal.egzabeher eskmekota lemen ytbkalu.